So my first failure of the A to Z Challenge – I missed N completely. Totally stumped on that one. I could think of topics – names for example – I just didn’t have anything remotely interesting to say! Moving swiftly on, O comes very nicely to coincide with a book I was planning to review on here anyway. 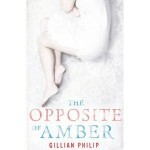 The Opposite of Amber is the latest book by Gillian Philip – if you read my Firebrand interview way back in the autumn or follow me on Twitter you’ll know I’m a big fan of Gillian’s and I was really excited to see this book come out a little early that I went finger-happy and pressed ‘one-click buy’ on Amazon before I could stop myself. Ah well – so worth it. The Opposite of Amber follows two sisters, Ruby and Jinn, and what happens when outside influences interfere with their close and loving relationship. Ruby is the narrator, and her very distinctive voice touched me very deeply. It’s described as a thriller, and on one level it is, but it’s much more than that too. I’d also say that although Gillian writes for Young Adults, this is easily a cross-over book and likely to appeal to just as many Not-So-Young Adults. I found that pace-wise there was a distinction between a slower, beautifully-written first half, in which I got to know and love the main characters. All the characters were incredibly well-done – individual and unique and intensely human. If you want to know how to write good characters, read a few of Gillian’s books. The language as well was very evocative; there was one piece in particular when Ruby and Jinn were at the ice rink at the same time but separate that made me fill up a bit. In the second half the pace really picks up. It reminded me of a roller coaster where you are almost lulled into a false sense of security when the coach trundles along leisurely then dives at top speed making your stomach leap. My heart was actually racing when I finished the book, with a few scenes I never saw coming. I’m not giving any more away but I seriously recommend that you go and buy this asap. Here’s the link to Amazon. If you haven’t heard of Gillian before, here’s a link to her website. Interesting. I’m stopping by from the A to Z challenge and I look forward to reading more from you.